Spring Update - Exciting News! Hey everybody! Nibiru here with some exciting news! This month we reached a milestone! 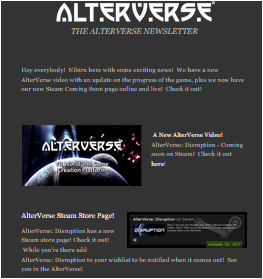 We now have over 1,000 AlterVerse Newsletter subscribers! That's right, over 1,000 people are keeping current and up to date on the AlterVerse. Thank you to everyone for subscribing! Read about it here. Find out what Scot's focusing more on here. 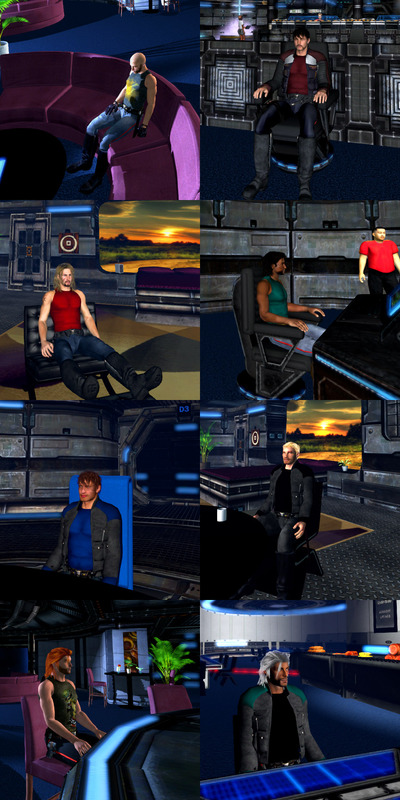 Check out all the cool screenshots from inside an AlterVerse Disrupter Ship! We've been posting pics on Twitter regularly for the last couple of months. Visit our AlterVerse Twitter here and check them out! Add AlterVerse To Your Steam Wishlist! AlterVerse: Disruption coming soon on Steam. Visit our Steam Store Page here and add AlterVerse to your Wishlist so you get notified as soon as it's released! That's all for this edition of the AlterVerse Newsletter. P.S. Check out the new screenshots on the AlterVerse Home Page and don't forget to visit the AlterVerse forums often and remember you can always follow us on our AlterVerse Twitter and like us on Facebook, and even subscribe to our AlterVerse YouTube channel to stay up to date with news from the AlterVerse! See ya in the AlterVerse!